I *love* re-fashioning thrift store staples into unique, historically-inspired outfits! 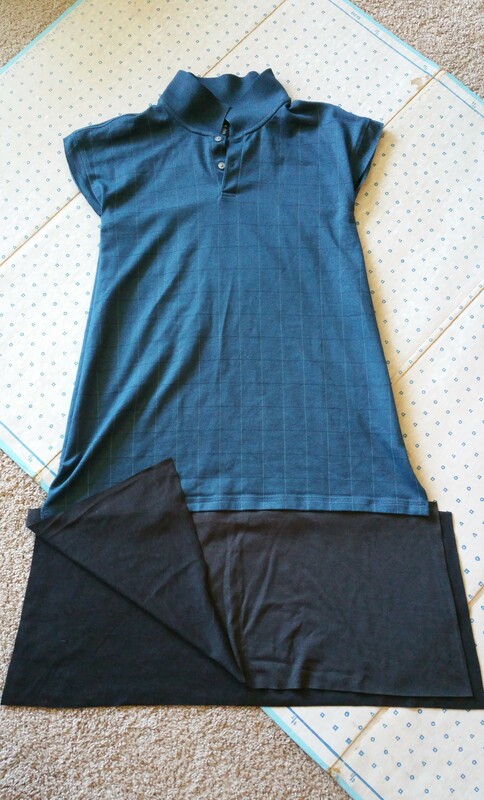 Oversized polo shirts are ideal for such projects, since they are easy to find and are practically dresses already! With the addition of some coordinating fabric and elbow grease, my polo shirt will become a drop-waist dress inspired by the 1920’s. 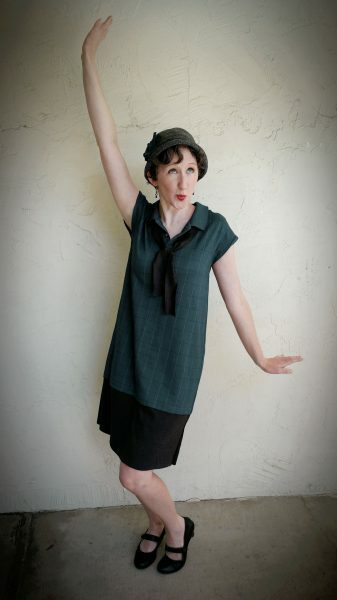 Calling all flappers: it’s time to get sewing! Step 1: Find a big men’s polo shirt at your local thrift store. The longer the shirt, the better! Look for a shirt that is a color/pattern that can easily coordinate with other fabric. Also watch out for stains and signs of noticeable wear. Step 1.5: Goofily pose in your shirt after washing it! 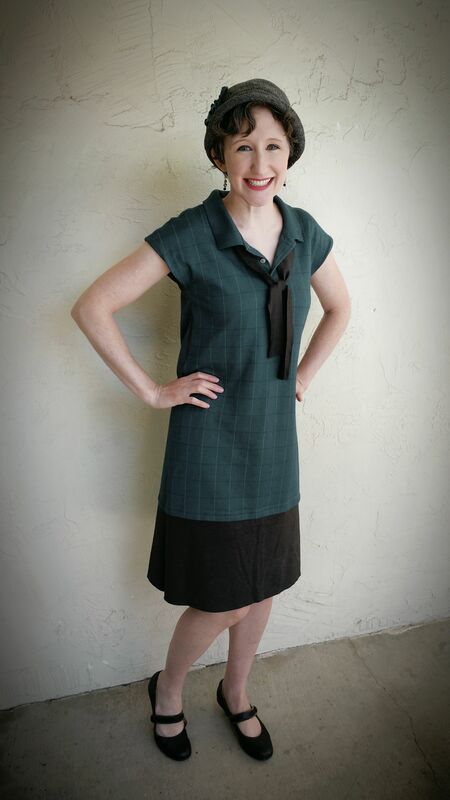 Gather a skirt-sized piece of coordinating fabric, and make sure it is washed and somewhat wrinkle-free. This fabric will become the “skirt” part of the drop-waist dress. 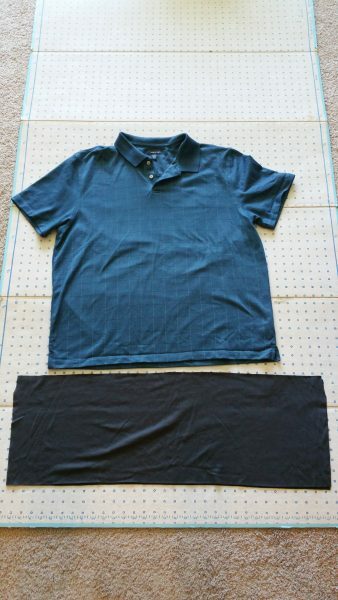 Lay your shirt out flat and smooth out the wrinkles (iron if necessary). Now it’s time to re-fashion that polo! I folded the shirt in half, being careful to smooth out all wrinkles. I pinned the side and shoulder seams to keep the fabric from moving around. Next, I got out a loosely-fitting Tshirt to use as a pattern. A word of warning: DO NOT use a snug or even perfectly-fitting shirt as a pattern, or you will cut your polo shirt too small! This dress is meant to hang loosely on the body, so cut bigger than you think you will need. (Learn from the voice of experience, People!) 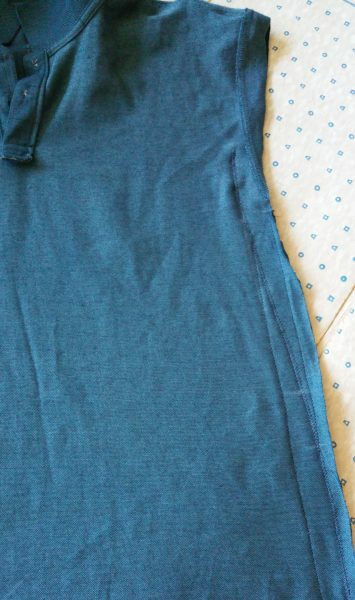 You can see in the picture that I measured about 2 inches of EXTRA fabric around the body of the T shirt before cutting the polo. I did cut off most of the polo’s sleeves. Next, I needed do some prep work before hemming the side seams of the polo. First, I used the Tshirt to help me guess how high the side seams should be sewn under the arm. I marked this with fabric chalk. I also measured several inches up from the bottom hem of the shirt and marked this spot on both side seams. This marking will remind me to not stitch all the way to the bottom of the shirt. I sewed the side seams using a large, loose stitch and standard seam allowances. (Be sure to use the right kind of needle for your fabric, which in my case was knit!) I stopped stitching several inches from the bottom of the shirt, as I had marked off earlier. I tried on the shirt, and found that it was too big and the seams needed to go higher under the arms. I used rulers and chalk to measure where I thought the seams needed to be. As before, I sewed the seems and tried on the shirt. Better this time! During all this trying on, I found that the sleeves were way too long. I left about an inch of sleeve beyond the shoulder seam, then cut the rest off. After another just-to-double-check-try-on, I determined where the finalized side seams should be. I then stitched the seams using a stitch designed to both bind and serge the seams in knit fabric. In the picture, you can see how many tries it took me before I liked the placement of the seam! You can trim some of the extra fabric off after you sew the final seam. Once the shirt portion of the dress fit, I turned my attention to the skirt. 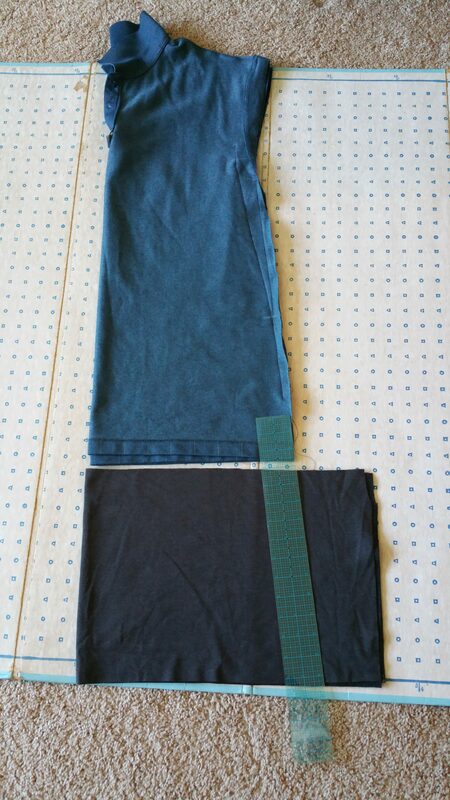 I laid the two pieces of skirt fabric out flat, then folded the double layer in half. I lined up this skirt fabric with the folded shirt. I cut the skirt so that it began the same width as the bottom of the shirt, and then increased to a slight a-line towards the hem. Next, I pinned the skirt pieces to the bottom hems of the shirt. 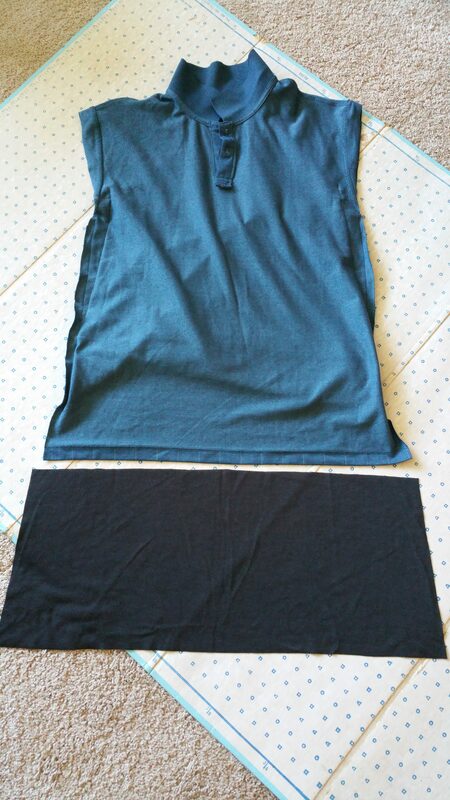 One skirt piece got pinned to the shirt front, the other to the shirt back. (Remember: the side seams of the shirt were not yet stitched all the way to the bottom of the shirt. This allowed me to work with the front and back of the shirt individually, since they were not fully attached to each other.) I liked the look of the shirt’s hem, so I kept that as a flap with the skirt pinned behind it. I pinned and stitched the skirt pieces to the shirt pieces. With the skirt pieces sewn to the shirt, it was finally time to extend the side seams all the way to the hem of the skirt. I pinned and sewed! After trying on the dress, I decided to shorten the skirt a couple inches so that it reached right below my knee. I saved the trimmed fabric for later use! Now to finish those sleeves. I simply folder under the extra fabric extending beyond the shoulder seam and pinned it in place. Stitched that in place and the “sleeve” was done. I had just enough fabric trimmings left to make a couple accessories! 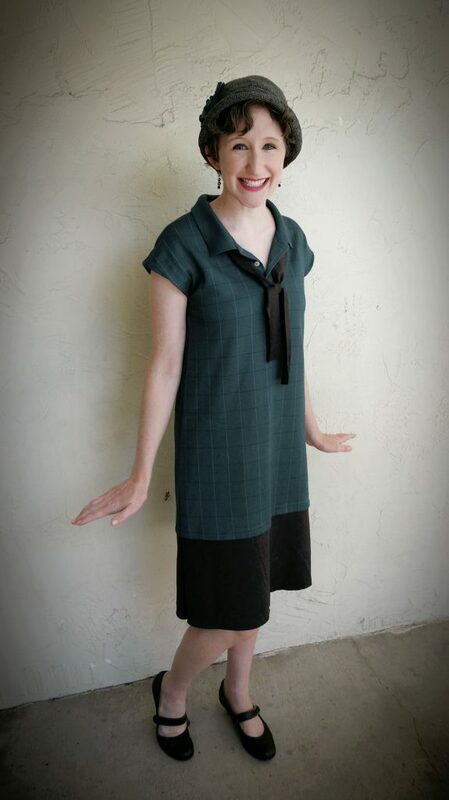 (Nothing like some custom detailing to make a re-made dress look vintage!) The strip of gray fabric became a sailor-like necktie. The blue circles would morph into a flower that could be clipped to my hat. I cut out petals from the circles and cut small pieces of black felt for the backing. I stacked the flowers from largest to smallest, attaching each new flower layer with hot glue. A cute lil’ button became the center of the flower, while a piece from the shirt’s hem acted as leaves. The circle of felt became the base of the flower, while the rectangle secured the hair clip to the base. I used my E6000 glue to attach the hair clip to the felt. I couldn’t wait to style my newly-made dress! 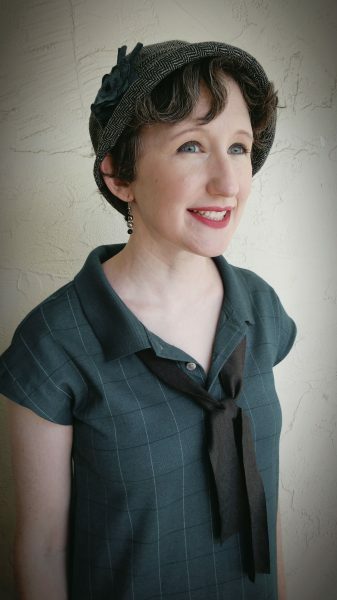 The addition of my favorite cloche hat and vintage-y shoes completed the look! Of course, I also added my homemade accessories and a LOT of eyeliner! Check out this historically-inspired 1920’s makeup tutorial (here) for more ideas! Much fun! 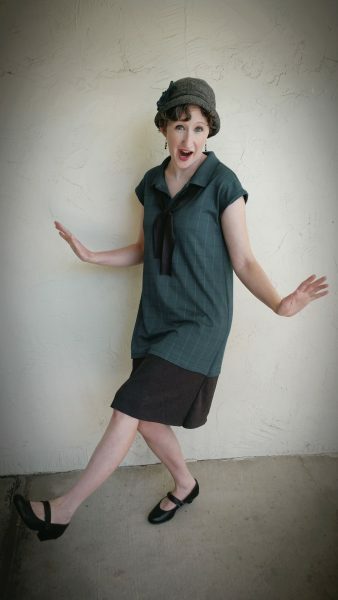 This 1920’s outfit makes me want to dance! Hey, Flappers! Who’s ready for a polo shirt dance party? !